In the last few years, Vietnam has risen above many of its neighbors in ASEAN posting impressive trade volume growth with a variety of countries. With key partners such as the US and EU, Vietnam is leading the pack in ASEAN as the biggest exporter to the US and only ranks second to Singapore in terms of trade with the EU. This impressive growth has been a crucial precursor to the FTA between the EU and Vietnam (EVFTA) which was recently concluded. With the FTA in place, and in light of recent events within Europe, Vietnam has the potential of not only continuing this trend, but also improving its own production and expanding its key industries exponentially. EVFTA comes as no surprise to both sides: Vietnam and EU have been long-standing trading partners in the last decades, with their two-way trade value increasing from US $6.3 billion in 2003 to US $41.2 billion in 2015. The EU is not only one of Vietnam’s key trade partners, but also a key investor, having committing US$1.9 billion in FDI during 2015 alone. This makes the EU Vietnam’s third biggest investor. The trade relationship between the two has also been one of mutual benefit; as EU exports high tech products including machinery, aircrafts and pharmaceutical products to Vietnam, and Vietnam exports a wide range of agricultural and manufacturing products to EU, including textiles and garments, footwear, coffee and seafood. 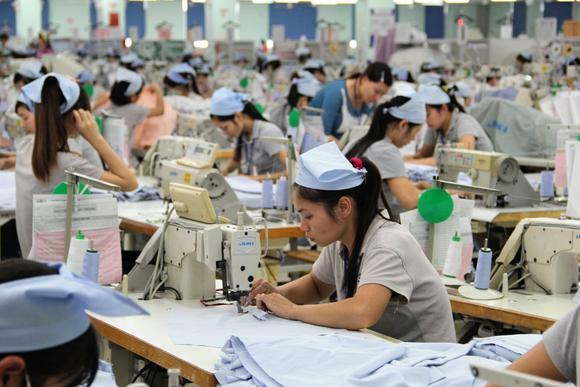 Beyond this, Vietnam is also becoming increasing attractive with for competitive wages – a key selling point for labor-intensive industries such as textiles. The poition of the Vietnamese market stands as a significant point of competition when compared to other world manufacturing hubs such as China, India, Malaysia and Thailand. On a regional level, Vietnam has climbed to become EU’s second most important trading partner amongst all ASEAN members, surpassing regional rivals such as Indonesia and Thailand in recent years. Gaining another stepping stone into trading with ASEAN helps the EU further improves its trade and investment relations with its third biggest trading partner. EVFTA, at its core, aims to liberalize both tariffs and non-tariff barriers for key imports on both sides over a period of 10 years. For Vietnam, the tariff elimination will certainly benefit its key export industries, including the manufacturing of phone and electronic products, textiles, footwear and agricultural products such as coffee. These are not only Vietnam’s key industries, but also very labor-intensive in their nature. The FTA will help increasing Vietnam’s exports volume to the EU, and as such facilitate the expansion of these industries, both in terms of capital and increasing employment. Both Vietnam and EU have an articulated timeframe by which they have committed to liberalize all tariffs. Key among these commitments is a 7-year timeline for Vietnam’s textile and footwear products which the EU has agreed to. As a large proportion of Vietnam’s exports to the EU are consumer goods such as clothing, textile and footwear, the FTA would open a floodgate for a larger volume of these products coming from Vietnam into the EU. The tariff liberalization over the course of seven years will allow for significant expansion of these labor-intensive industries. As Vietnam continues to grow, it is likely that it will see a increasingly pronounced shift in manufacturing towards more technologically advanced products, such as phones and other electronics, EVFTA will possibly provide more export revenue from clothing and footwear products, but not as much further expansion of these industries. For Vietnam’s budding phone and electronic manufacturing industry, the FTA could possibly propel the industry far ahead of the ASEAN peers, especially the region’s electronic manufacturing powerhouse – Malaysia. Although Vietnam is yet to have an extensive developed electronic manufacturing industry in the present, the FTA provides Vietnam with an unprecedented chance to take a lead in electronic products, and hence expansion of this budding industry could be a smart move for local businesses. Recent changes in the EU, in particular Brexit, could impact the outcomes and importance of EVFTA. Considering that the UK is one of the biggest markets for Vietnam’s exports, and also one of Vietnam’s biggest investors; trade and investment from the UK is likely to remain in limbo as long the markets are processing post Brexit Fallout. Those considering investment should prepare for the real possibility of reduced demand from UK consumers in relation to their recently reduced purchasing power brought about by the Pound’s depreciation. The impact of Brexit on EU trade and investment is however another story. While the turmoil of Brexit amplifies an existential crisis that has been manifesting in Europe for some time, there are strong reasons to believe that Vietnam will continue to reap the benefits of European trade in the years to come. Much of this boils down to the EU’s increasingly stringent standards and quality controls applied to goods coming into the EU. Unlike many of its ASEAN neighbors, Vietnam has concluded a trade agreement with the European Union. Included within this agreement are numerous provisions that help to converge Vietnamese standards with those of the EU. As FTA negotiations between the EU and other ASEAN states are likely to stall as the EU attempts internal damage control, the importance of the Vietnamese market will only grow as elements of EVFTA are implemented and corresponding non-tariff barriers are removed.